Trust. Through more than six decades of non-commercial broadcasting from the University of Virginia, WTJU has earned the trust of our listeners. WTJU has deep local ties and tremendous loyalty among our listening audience. They believe in our mission and trust that we will carry it out well. Sponsoring programming on WTJU 91.1 FM is a proven way to distinguish your business or organization. Supporting WTJU enhances your image as a participant in, and supporter of, the Charlottesville-area community. The station reaches more than 40,000 people each month. WTJU listeners are diverse in many respects, but are notably distinguished by their educational excellence and passion for this community. Contact Brian Campbell for more information: wtjuunderwriting@virginia.edu, 434-243-8831. Non-commercial underwriting is similar to – but a little different from – traditional advertising. 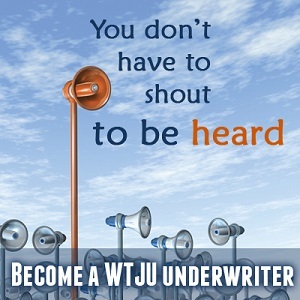 Underwriting WTJU is a way to broadly share information about your business. It’s also a way for your business or organization to gain community-wide recognition for your support of WTJU’s community mission. As a business sponsor, you may elect to underwrite one or more regular programs — or to underwrite the station as a whole. Underwriting packages are very affordable, ranging from short-term sponsorship to robust year-round support. WTJU is owned by and located at the University of Virginia. The University is a non-profit organization, so your support of WTJU is tax-deductible.